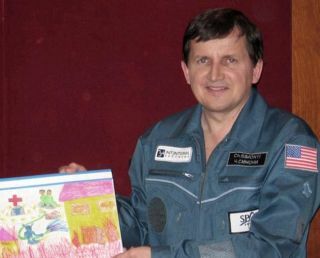 Space tourist Charles Simonyi poses with one of three drawings he is carrying with him to the International Space Station, which was chosen as the result a contest run for Hungarian students. The drawings are among his souvenirs and personal mementos. Charles Simonyi has his passport with him, ready for his arrival aboard the International Space Station (ISS) today. "Just to get it stamped, not that I think you should have to have a passport to go to space," Simonyi, a former Microsoft software developer, told collectSPACE.com before his launch this past Saturday. The government-issued document is among Simonyi's small stash of souvenirs and personal items that he has packed for his 10-day stay on the orbiting outpost. As the fifth space tourist, Simonyi will spend his time conducting experiments for international space agencies including the European Space Agency, the Japanese Aerospace Exploration Agency and the Hungarian Space Office. In his free time, the American billionaire plans to blog about his experience on his website, communicate with students on the ground and take many photographs. "I am bringing up a lot of camera equipment and a lot of blank tapes and cassettes," said Simonyi, who has also brought an MP3 player with over 1,600 tracks loaded "all legally" with classical and rock music. He also plans to establish the station's first reading room. "I am taking some books. I say I am starting a library -- there are books up there, but anyway I'm the first one to say it should be a library, so I am taking up a couple of books." The books he is bringing are "Faust" by Johanne Wolfgang von Goethe and "The Moon is a Harsh Mistress" by Robert Heinlein. Delivering enrichment of a different type, Simonyi also carries a six-course meal chosen by close friend Martha Stewart and prepared by French chef Alain Ducasse. It includes roasted quail, duck breast confit and shredded chicken parmentier. As a high school student in Budapest, Hungary, Simonyi first learned to program computers on the Soviet Ural II. Moving to the U.S. to attend the University of California at Berkeley and then earning a doctorate at Stanford, he began working in 1972 at the Xerox Corporation's Palo Alto Research Center (PARC), where he created Bravo, the first WYSIWYG (what-you-see-is-what-you-get) text editor. From there, Simonyi joined Microsoft in 1981, leading the teams that developed Word and Excel. Today, he is the president and CEO of Intentional Software Corporation, a company he founded in 2002 to focus on improving ways in which organizations write software. In a nod to his nation of birth, Simonyi has with him three contest-winning drawings created by Hungarian children. Held by the Hungarian Red Cross, the contest called for children in over 50 schools across the country to submit drawings that depict the organization helping people on and off the planet. Simonyi will use the ISS's ink stamp to mark the drawings as having been on-board, and will return the pictures to the artists during a ceremony to be held after his flight. Simonyi said in a statement that he was "honored to support the Hungarian Red Cross and to involve children from Hungary and around the world in the wonder of space travel." Using amateur radio, Simonyi also plans to speak directly with high school students from aboard the station in three events across the United States. Symbolizing his history with computer software, which ultimately led him to being able to afford the $25 million trip to space, Simonyi has brought a Ural II paper tape. "To remind me where it all started," Simonyi said of the memento. Simonyi's heritage and history are also represented by the design of his personal mission insignia. The diamond shaped patch combines an outer rectangle of Hungarian, Russian and American flags, and an inner circle that has depictions of the station and Soyuz spacecraft inside a constellation of stars. "It became evident that we needed to have a patch, so I was trying to think of what would be the good motives that you would want to show on the patch and of course, what might be the motto for the flight... it became 'From Ideas to Reality'," Simonyi described to collectSPACE.com. "'Reality' of course, was being there, the space station, Soyuz and so on. We needed an illustration for an 'idea'. In a number of different ways, the simplest idea is the theorem of Pythagoras. How to represent the theorem of Pythagoras?" Simonyi asked rhetorically of the relation between three sides of a triangle in geometry. "We had a couple of brainstorms and it went through a couple of different iterations. It was first a cutout of the shape of the theorem of Pythagoras... [with] the reality behind it. That didn't work graphically." "Somehow the idea of a constellation that looks like the theorem [was suggested], which is a fascinating idea by itself because there is no such thing. Imagine if there would be, that would be quite remarkable! But no, we imagined a theorem in the form of a constellation, it was an interesting thought and it worked graphically very well, so that's it. And then of course, the background of flags is pretty important, too," explained Simonyi. In addition to the patches sewn on his space- and flight- suits, Simonyi took with him a small supply of emblems as well as U.S. and Hungarian flags he wrote in his blog "will make excellent gifts some day to museums at home in Seattle and in Hungary." Even before applying to fly in space, Simonyi collected space artifacts as a hobby. "I have a few pieces of clothing from early Russian [cosmonauts]. I have Komarov's sweatpants, or at least sweatpants that are said to have belonged to Komarov, things like that, but mostly written materials," Simonyi revealed in his interview with collectSPACE. "I have a few checklists. For example, I have several of the checklists that [Apollo 11 moonwalker] Buzz Aldrin has been selling. I love documentation, checklists or manuals; all the Apollo manuals, the Gemini manuals, all the manuals." Simonyi isn't the only collector coming on-board the ISS when Soyuz TMA-10 docks just after 3:00 p.m. EDT this afternoon. One of his two traveling crew mates, Fyodor Yurchikhin collects stamps, that is when he has the time. "I collect stamps," Yurchikhin proudly told collectSPACE before his launch. "I cannot tell you that I collect now the stamps because I should have enough free time, I do not have enough free time. Now, my collection waits for me." He may not have stamps aboard, but Yurchikhin, who is set to take over command of the station, has something just as, if not more, meaningful along with him: a stuffed toy dog. "My small dog is with me because this dog lives with me I think more than 30 years from my high school because my favorite teacher give me this toy. It's like talisman for me. Everywhere in my travels this dog is with me." Indeed, this isn't the first time the toy dog has traveled to space. It accompanied Yurchikhin on his first mission in 2002 with the crew of STS-112 on space shuttle Atlantis. Like his fellow cosmonaut, Soyuz TMA-10 commander Oleg Kotov also brought a toy, a small black cat named "Dimlar," after his two children Dima and Lara. The doll could be seen hanging in the Soyuz cabin during launch [YouTube video]. Yurchikhin and Kotov will remain on the ISS, replacing Michael Lopez-Alegria and Mikhail Tyurin, who will return to Earth with Simonyi on April 20.